The MH series illuminated switch offers multiple LED color choices including bi-color lights with and without actuator. 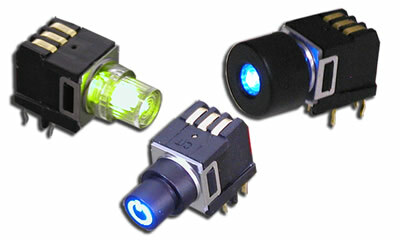 This pushbutton switch is now offered is a black actuator with a laser etched ON/OFF symbol. Featuring over-travel and positive feel, the MH series right angle pushbutton switch can be customized to fit your needs. You can choose from SPDT or DPDT poles and opt for a push switch with or without a cap.